The Kingdom of Tonga is a small island nation in the South Pacific. It is one of the few that did not undergo formal colonization, though became a British-protected state in 1900. Despite this, however, it has retained its own system of government: monarchy. The political structure of the country had barely changed since King Taufa’ahua drafted the constitution in 1875. The cabinet and 2/3 of the parliament are appointed by the king, so the people of the country have very little representation. 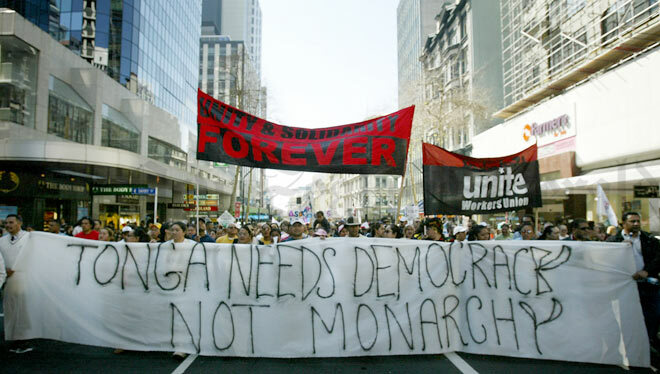 The country also does not have a history of strikes or a labor movement, particularly because the monarchy has not allowed the unionization of most workers. Despite their lack of unionization, on July 22, 2005, 2000 of the country’s 5000 public servants went on strike to call for pay raises for all public servants. This was in response to wage raises given to senior public servants but denied all other public servants. That same day, about 1000 public servants rallied in the capital of Nuku’alofa in a protest organized by the Public Servants Association (PSA). They set up canopies in Pangai Si’I, a park near the parliament building, singing songs, eating, and talking. The strikers met there daily for the majority of the rest of the campaign. The members of parliament elected by the people of the country (People’s Representatives) also threatened to walk out of parliament in support of the strikers the following week. Early that day the strikers had been told by the parliament to express their grievances through the approved process of taking it up with their department heads, but Tonga Finau, one of the leaders of the PSA, decided that going directly to the government was the only way to create change. It is important to note that Finau and the other PSA leaders explicitly called on all strikers to be nonviolent throughout the campaign. The Prime Minister asked strikers to return to their work, but with no success. Within the next three days, many government ministries were closed due to understaffing. For instance, the Ministry of Lands had only 20% of its workforce, while only 2 people showed up for work at the Ministry of Labour. That same day, 1400 public school teachers joined the strike in support of the civil servants. After two days of ambiguous commitment on the part of the teachers, all 115 public primary schools and 8 of the country’s secondary schools closed early for the August holidays. According to the Ministry of Education, only 114 secondary schools teachers in the country showed up to work on the 22nd, and 134 on the 25th. On the 24th, Tonga’s Human Rights and Democracy Movement had also voiced their support of the strikers. On July 25th, over 2000 public servants held a rally at Queen Salote Hall and then marched on the parliament building at noon to present a letter of petition to the Speaker of the House demanding 60%, 70%, and 80% pay raises for different levels work, no disciplinary repercussions against strikers upon returning to work, and a two year suspension of the salary review that had been scheduled before the strike. Upon receiving it, he told the strikers that it would be looked over in parliament. However, no action was taken on their part to resolve the dispute. Meanwhile, the strikers continued to hold rallies on Pangai Si’I. The private sector was also impacted by the strike both due to the buying power of those striking, in addition to the connection government-paid jobs had with the private sector. For example, the unloading of airline freights was almost completely halted because only one customs official was showing up for work. On August 4th, several PSA leaders met with a cabinet subcommittee to discuss their demands. Vili Vete, a member of PSA’s Interim Committee told the strikers that the government was only willing to offer 10%, 15%, and 20% pay raises. The PSA rejected this offer and began planning a mass march on Tonga’s king, King Taufa’ahau Tupou IV, for August 8th, led by Prince Tu’ipelehake (considered to be a “people’s prince). Vete also told a cheering crowd that a group of health workers had sent a letter of warning to the minister health that they were planning on joining the strike. Vete then called on some of the most essential workers in the country, including doctors and nurses, to join the strike. Later that same day, health workers in Nuku’alofa joined the movement. Workers at Tonga’s main Vaiola Hospital decided to meet at a church in the city and march to Pangai Si’I in the middle of the city to join the strikers on the lawn. They sent a warning letter to the cabinet, and were met with a reply from the minister of health saying that the government could not meet the strikers’ demands. This prompted the health workers to join the strike after deeming this an inadequate answer. They had had a short meeting that morning in which they decided to meet at the church in their uniforms and to join the over 3000 public servants at Pangai Si’I. By early August, the demands of the strikers began to broaden. They claimed that the King’s cabinet distributed the country’s wealth in unjust ways, favoring development companies and the Royal Tongan Airlines (a failing company), while ignoring those with the “least privilege.” Leaders of the PSA also felt that even if their initial demands were agreed upon by the government, going back to work for the Department Heads would still be an unjust situation, so they considered demanding that they finish out their two year contracts, and then resign to allow for replacements. However, it seems as though this was never made an official demand. Still, Finau did consider the strike as potentially creating the opportunity for political reform. Specifically, he saw it as a potential way of opening up the way for trade unions. Officially, however, the PSA kept its focus on its original objectives, though Malio Takai, deputy chairman of the PSA’s strike committee, did say that it was hard to not engage in some dialogue about the wider political structure because of the government’s refusal to move. The march that was scheduled for August 8th was carried out, but no details could be found. Workers continued to strike, but on August 12th, cabinet members ordered the police to prevent strikers from entering Pangai Si’I, but on August 13th,the Land Court overturned the cabinet order. Chief Justice Webster ordered the government not to remove civilians from public space. In response to the growing antagonism, on August 15th, King Tupou joined over 5000 people (both strikers and others) at the Teufavia Stadium to pray for a solution to the strike. A parliament member from New Zealand, Keith Locke, was also planning on traveling to Tonga in support of the workers. On August 17th, scores of students were arrested for ransacking their school, Tonga College, and torching several government cars after threatening to burn government buildings if authorities did not move to settle the strike. They were also demanding the reinstatement of the college principal and other senior staff who had been dismissed for supporting the strike. Although the vandalism was not sanctioned by the PSA, the media jumped on this as an outbreak of violence in the campaign. The New Zealand government offered to help Tonga resolve the strike in response to the violence, but the PSA refused. Additionally, there was no more violence in the remainder of the campaign. The strike was also gaining international attention, particularly in New Zealand, where, on August 20th, 100 protesters sought a meeting with King Tupou, who was visiting New Zealand at the time. By August 23rd, Parliament had recommended that the government grant the demands of the PSA, but the cabinet rejected the suggestion. The Minister of Justice Hon Siaosi ‘Aho said that the strikers were “holding the people of Tonga hostage” with unreasonable demands, and that it would destroy the country’s economy to meet the pay raises set by the PSA. They also brought in a judge from New Zealand to mediate discussions, but after three days of negotiation, the PSA terminated the talks, saying they would continue to strike until their demands were met. They also expanded their demands, calling for the resignation of the cabinet and a democratically elected parliament. Negotiations were attempted again on September 1st. The Princess Regent, her brother the Prime Minister, and the cabinet came out to meet the strikers at Pangai Si’I to offer significant temporary pay raises while undergoing negotiations. On September 3rd, the government agreed to grant the PSA’s basic demands of 60-70-80% pay raises, no disciplinary action against strikers, and a suspension of salary review. The government also said that if the PSA was not happy with the terms, they could negotiate further. The PSA deliberated, and agreed, offering to return to work on September 5th. On September 4th, Tonga’s cabinet also pledged to consider setting up a royal commission to review the constitution of the country to look at ways to make the country more democratic. They also pledged to consider allowing unions. In October, after the strike was over, New Zealand also started calling on Tonga for democratic reform, trying to hold the cabinet to its promise. It is now planning on becoming a constitutional monarchy, and holding a more representative election in 2010. One of the reasons the campaign stayed so strong throughout the month and a half that it went on was that, despite the lack of unionization, the PSA leaders were able to keep the workers in a cohesive body, preventing the government from making deals with individual groups. Fonua, Pesi. “Tonga Cabinet to Consider Strikers’ Call for Democratic Reform.” 4 September 2005. Matangi Tonga. BBC Monitoring Asia Pacific. 8 April 2010. “Interim Pay Rise Could End Tonga Strike.” The New Zealand Herald. 1 September 2005. Jacobson, Julie. “Riots Follow Tongan Strikes.” 19 August 2005. The Dominion Post (New Zealand). “Minister says Tonga Being Held to Ransom by Strikers’ ‘Unreasonable Demands.’” 27 August 2005. Matangi Tonga. BBC Monitoring Asia Pacific. 8 April 2010. Neville, Sophie. “Goff Offers Help Over Tension in Tonga.” 22 August 2005. The Dominion Post (New Zealand). “Private Sector Hit Hard by Tonga Civil Servants’ Strike.” Radio New Zealand International. 2 August 2005. “Tongan Government Concedes to Strikers’ Basic Demands.” 3 September 2005. Matangi Tonga. BBC Monitoring Asia Pacific. 8 April 2010. “Tonga Health Workers to Join civil Servants’ Strike.” 4 August 2005. Matangi Tonga. BBC Monitoring Asia Pacific. 8 April 2010. “Tongan King Joins Prayers for End to Strike.” 15 August 2005. Matangi Tonga. BBC Monitoring Asia Pacific. 8 April 2010. “Tonga Prince Set to Lead Civil Servants’ March.” 4 August 2005. Matangi Tonga. BBC Monitoring Asia Pacific. 8 April 2010. “Tonga: Striking Civil Servants Launch Financial Appeal.” 7 August 2005. Matangi Tonga. BBC Monitoring Asia Pacific. 8 April 2010. “Tongan Teachers Join Civil Servants Strike.” 26 July 2005. Matangi Tonga. BBC Monitoring Asia Pacific. 8 April 2010. Venter, Nick. “It’s No Picnic for Tonga Strikers.” 23 August 2005. The Dominion Post (New Zealand). Venter, Nick. “King’s Home Burns Down.” 24 August 2005. The Press.